School begins in just a few short days, my room is ready, and my head has reached its normal level of spinning. 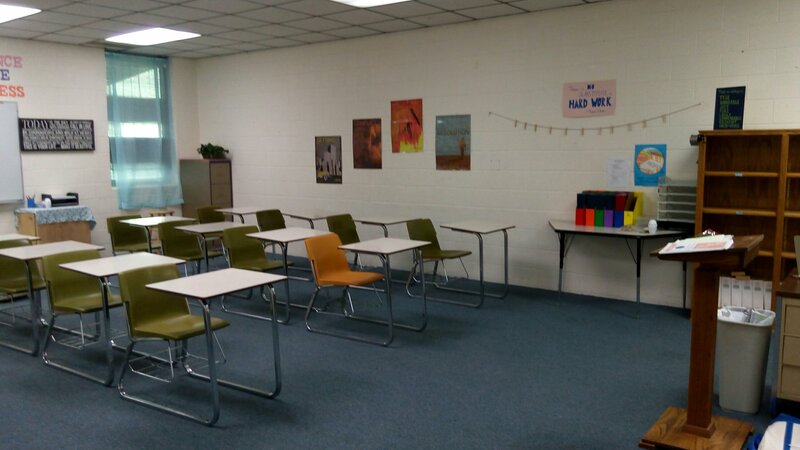 I have pretty much finished decorating my classroom if the posters will stay on the walls. 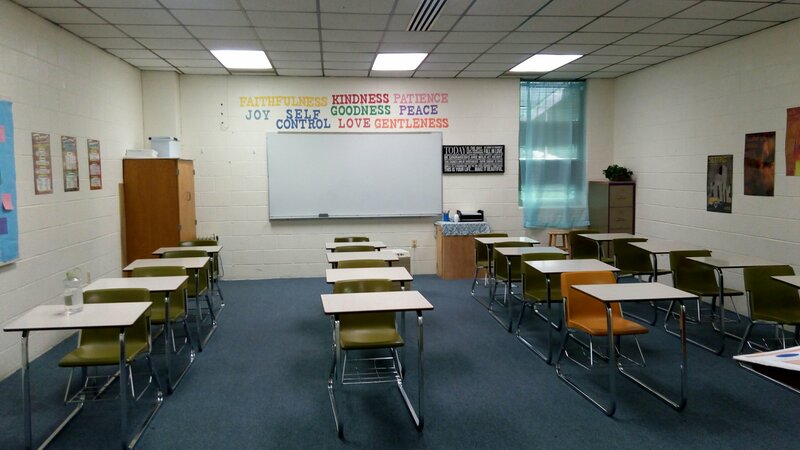 I’m grateful to be in a place where I can post scripture on my walls that will help me feel encouraged as well as hopefully encourage the students. 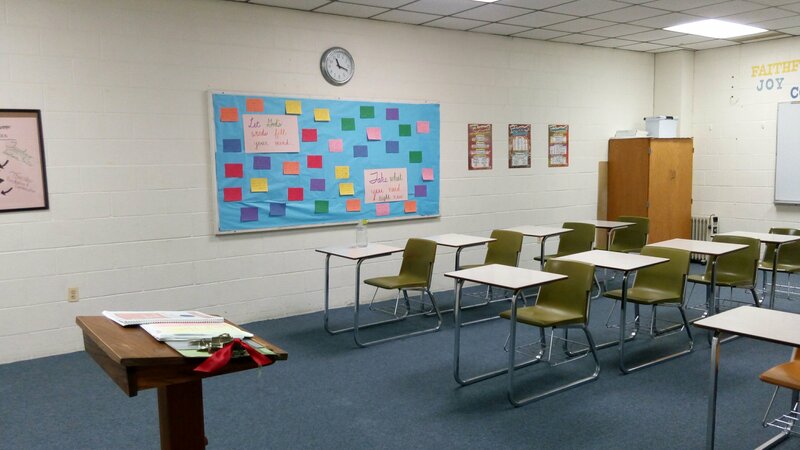 I’m also thankful for having such a large classroom. School is right around the corner. While at some points, I feel as if summer just began, in other ways I am ready to have a purpose for each day. There are so many ideas floating through my head (and hopefully all going into my notebook so they will be remembered) about how to make this school year better than last year. In order to keep myself fresh and restore my motivation, I’ve been reading some teacher books (I know…nerdy). One of these books was Positive Discipline: Tools for Teachers by Jane Nelson and Kelly Gfroerer. When I first came across this book, I was interested because discipline and classroom management is one of my self-identified growth areas. Sure I can write detentions and write-ups, but that was only effective with some students. As I read this book, I also identified instances where I know I could have responded to a situation with more grace. Mainly this book was a refresher of many concepts I remember being told in teacher training, but those concepts got lost in the stress of being a new teacher. Some of those concepts include giving students the power to make good decisions by asking rather than demanding, having a plan for when students make bad decisions, and allowing myself to cool off before taking action. One very helpful tool was the Mistaken Goal chart. It identifies four reasons why a student might be misbehaving: undue attention, misguided power, revenge, and assumed inadequacy. The chart identifies how teachers might feel and normally react and then some empowering behaviors to try instead. I think this tool might be on that I post next to my desk as a tool of reflection and growth. The book itself is broken into very short chapters with a short tool, some real-life stories, and research to back it up. This makes the book easy to read in short segments which is probably better for reflection and action. Personally, as a high school teacher, I wish more of the examples had been from a high school classroom because I couldn’t picture using many of the tools in a 50 minute period with teenagers. I also wish the writers had provided more clarification about the tools because I often didn’t understand the tool until I read the stories. Coming in a paperback format and having coloring-book style pages, I think the book does contain useful information and is well-organized. I would definitely recommend it to elementary teachers. I hope that the authors will make an updated version for secondary teachers because teenagers are treated and taught differently than elementary students. School starts this week, and for the first time in my life, I will not be attending. When I first started planning this post in my head last week, I thought I would feel sad at this moment. I imagined an empty ache would ring in my heart. But that’s not the feeling I am experiencing. Yes, it’s odd, but it’s also strangely exciting. There won’t be any papers to stress me out or discussions to attempt to stay awake during. Of course there also won’t be any friends to meet on the sidewalk or crazy late night study sessions. I can’t just waltz over across the hall to my friend’s room or tell someone to meet me for dinner in five minutes. Things get a bit more complicated from now on, but I’ve always liked a good complication to struggle with. The most exciting part of this new step in my life is the possibility. My entire life lies before me. Yes, I kind of have a sense of what I want to do, but who knows where God might take me. In the immediate present, I am super excited about working with the BCM. I met with the leader today to discuss ideas and we are chock full. I sure hope those college students are ready for us. The elementary tutoring job is a bit daunting, but I am starting to realize that God can use me and mold me during this experience as well. He can teach me about being out of my comfort zone and give me an opportunity to share his love with some kids who might feel a bit unloved. I do expect some loneliness and nostalgia simply because I’m not living in a dorm room with my best friend or going to classes every day. The pay is much better but the drive is farther. There are ups and downs to this next part of my life, but I think I’m ready to take it all in. God has so much in store for me and I’m just ready to be used for his purpose. After all, what else matters? If you’ve been reading my blog for some time now, you know that I have this thing with cell phones. I’m just as guilty as you are about being on my phone when someone is talking to me, but it drives me crazy when someone does this to me, especially while I’m teaching. I’m feeling really old since now I can say, “when I was in school, students didn’t blatantly use their phone in class. At least we had the decency to hide our phones.” These seniors I’m student teaching for all have phones and all use their phones during class. If we were to take away all of the phones that are used in class, which is how phones were dealt with when I was in school, we would have every student’s phone (and the lead teacher’s phone. I really don’t understand why her phone rings during class, but that’s another issue.). Long story short. Disconnect. If you’re in class or a meeting or church or talking to someone, have the respect to at least look up from your phone. Remember to live in the present rather than trying to live in the cellular world with someone else many miles (or feet) away. As I said before though, I’m preaching to myself just as much as I’m preaching to you. Let’s all take a minute without our phones. Put it to the side and do something in entirety without checking it. Just see how much faster you can write a paper or how much more meaningful your conversation is without your phone. Or shocker, just see how much more you get out of a movie when you’re not texting. And for goodness sakes, let’s all stop texting while driving. It’s a bad idea. Tonight grading is on my mind since mid-term grades go out tomorrow. Several of the students are failing simply because they have not turned in assignments. My cooperating teacher’s policy on late work is that they will receive partial credit depending on how soon they turn it in. I like that she still allows them to turn in the work because the work is useful to their learning, but I don’t think their grade should suffer for it. For this reason I make sure to mark their original grade on the assignment before taking off for lateness. On the other hand I want students to become responsible young adults so there has to be some sort of penalty for late work. Another dilemma about late work is the fact that some students will simply copy a friend’s paper that has been graded and handed back. When helping a failing student organize his binder, my cooperating teacher found another student’s graded work. Of course that sort of cheating could happen before the student turns in an assignment on time. I want all students to learn and if I believe that every assignment is of value then every student should attempt the assignment. I’ve decided that homework , while it should receive a small grade so that students feel motivated to do it, should be more focused on comments to improve learning. To that end, I am fairly lenient when grading homework. I’ll give credit for close answers and then write notes to help the students improve their learning. Homework is supposed to be a form of practice, so I don’t feel that the students’ grades should suffer. I’m still in a bit of a moral dilemma about how to handle the inevitable late work. Maybe some soon to be teachers or experienced teachers out there could share their ideas on grading and late work. In middle school my friends and I passed notes during class. (It was one of my few digressions from good student.) Our method was to use a fairly small sheet of paper and stealthily write and pass. In seventh grade we even invented our own alphabet so if we got caught the teacher couldn’t read our oh so important notes. Things have changed since then. The students at school did an exercise about non-fiction in social media where they were supposed to silently pass notes. It made me recollect my middle school escapades. I wonder if children in school even pass notes on paper anymore. Or do they just text? It’s crazy to think how much has changed since I was in school. I used a floppy disk to write my fourth grade portfolio. The internet was fairly new. I didn’t have a phone until 8th grade and that was only because I went on a trip without my mom. (That phone was basic too but I thought I was on top of the cool ladder.) Kindle and e-book was not even a thought. I walked to the public library to use the internet. I remember when smart boards were new. 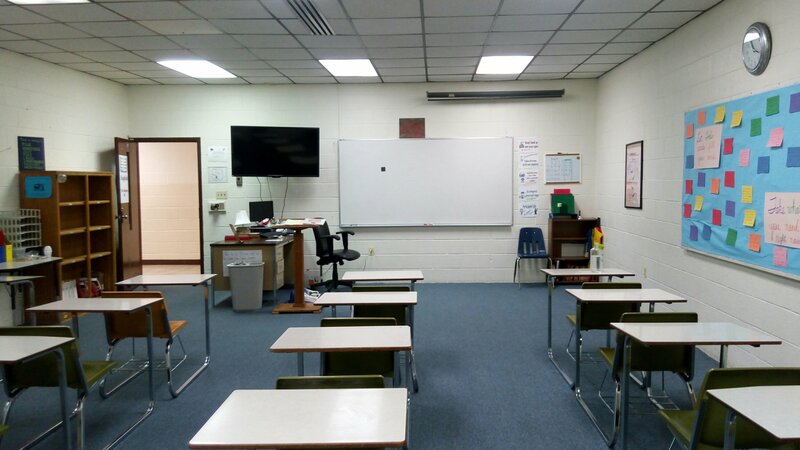 It was a big deal when my high school got wide screen tvs for every classroom. I’m not wishing to go back to those days. For the most part the progress society has taken has been positive. It just makes me start to feel old. Alas, the world is always changing.